You remember what the concerns with Austin Jackson used to be. There weren’t many questions about his defense, there weren’t many questions about his athleticism, there weren’t many questions about his ability to hit the ball hard. There were, simply, questions about his ability to hit the ball. A fine rookie season gave way to a mediocre sophomore campaign, in which Jackson posted the fourth-highest strikeout rate for a 24-year-old ever. 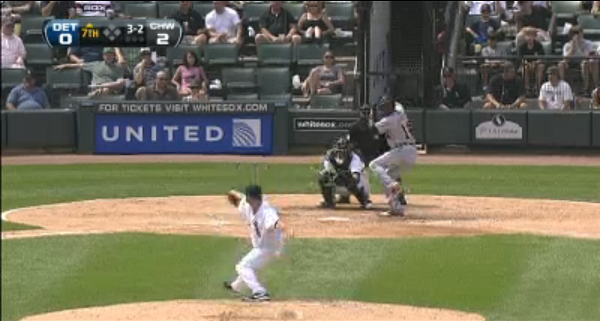 Before 2012, Jackson worked hard to modify his swing and, most visibly, eliminate his high leg kick. 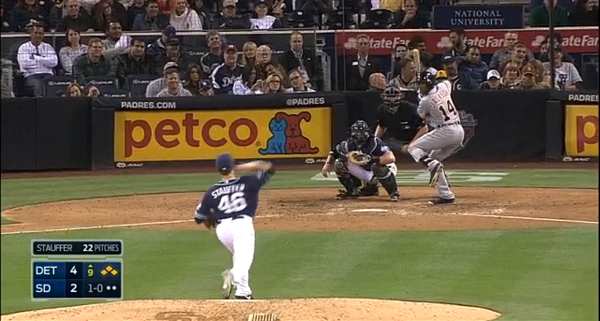 He chopped a fifth off of his strikeouts, and his lifted his wRC+ by almost 50 points. Austin Jackson had been fixed, and he turned into a legitimate everyday player. So fans knew what to credit for Jackson’s turnaround. Mechanical changes always make good sense after the fact, if a player’s been successful. Jackson had a rougher go of it in 2013, but he did keep his strikeouts down. Yet Jackson was awful in the playoffs, and he’s off to a scorching start in 2014, and he’s looked both very familiar and very different. Funny thing about those mechanical changes. Jackson has worked on his own and with new hitting coach Wally Joyner on making his swing feel more natural and comfortable. He brought back the leg kick before his swing, but he said it’s more important that he does it without thinking. “Going into the offseason, I had a plan I wanted to do,” said Jackson, who last month turned 27. “I wanted to eliminate a lot of extra movement. The trick was to get his stride started quickly and efficiently with a limited trigger. That in turn would promote balance. It would enable Jackson to, as he explained Thursday, “incorporate it into the load” (the swing’s maximum extension before moving toward a pitch). The result, as Jackson has displayed during these torrid weeks in Florida, has been a more direct path to pitches he too often missed during some rocky stretches in 2011 and 2013. 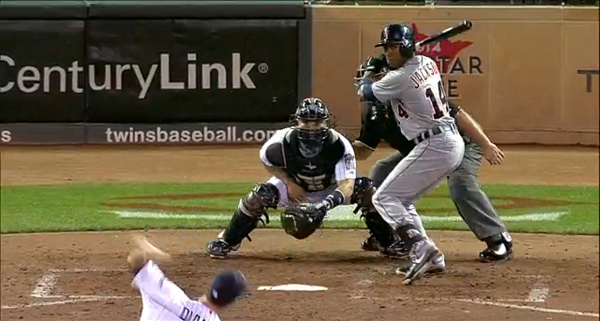 Austin Jackson is featuring a new, simplified swing. For those of us who don’t understand very much about swing mechanics, the leg kick is the easiest thing to pick up on, and that’s back to how it was. But his swing also seems shorter, with fewer holes than when he was younger. And what’s evident in the early numbers is Jackson is generating a very unusual profile for himself. In 2011, Jackson had baseball’s fifth-highest strikeout rate among qualified players. So far this year, his strikeout rate is on the fringes of the lowest third. He’s cut his strikeouts not quite in half, but almost in half, and his contact rate has soared to 84%. Consider what Austin Jackson used to be. Now consider that, in 2014, he has the same contact rate as Chase Utley. All of a sudden, Jackson has baseball’s lowest ground-ball rate. I’m not even necessarily saying that’s a good thing — I’m just noting that that’s a thing. As far as hitters are concerned, two of the numbers we expect to stabilize fastest are strikeout rate and grounder rate. For Jackson, the former has changed some, and the latter has changed a lot. Between 2002 and 2014, we have 4,322 player-season pairs in which a hitter generated at least 50 balls in play in consecutive years. There are only 11 instances of a bigger season-to-season drop in ground-ball rate than what we can observe with Jackson right now. There are zero instances of a bigger season-to-season gain in fly-ball rate. That is, Jackson’s fly-ball rate has gone up 25 percentage points, and no one else since 2002 has been able to claim that. Interestingly, FanGraphs puts Jackson at 21% line drives and 56% fly balls. However, MLBAM puts Jackson at 31% line drives and 46% fly balls. The point isn’t that one source is better than the other; the point is Jackson has hit a lot of borderline line-drive fly balls. Which isn’t surprising for a guy who owns a career .360 BABIP. It’s one of the highest BABIPs in baseball history. And though Jackson has a lot of career left to play through — a lot of career in which he’ll be slower than he is now — it stands to reason Jackson’s just long been able to make good contact when he’s made contact. And now he’s making more contact. And he’s making more contact in the air. One also notes that, for the first time, Jackson is batting in the middle of the lineup instead of leading off. He’s acknowledged that now he has a different set of responsibilities, and that could partially explain his new profile. Maybe he’s trying to more aggressively drive the ball to the gap or beyond it? Austin Jackson isn’t a power hitter, but he also isn’t a slap hitter, and we could be seeing him trying to play the part. Thus far, he’s been able to manage. Jackson’s entering the supposed prime of his career. He seems to be more of a contact hitter than a swing-and-miss hitter. He seems to be more of a fly-ball hitter than a ground-ball hitter. He’s a middle-of-the-order hitter, instead of a leadoff hitter. And he’s a hitter with a big leg kick, after being a hitter without a big leg kick, after being a hitter with a big leg kick. For a few seasons already, Jackson’s been a legitimately good player. He’s on track to do that again, in a very different way. And that allows him to be very different within a pool of the extraordinary. We hoped you liked reading The New Austin Jackson, Again by Jeff Sullivan! Thank you for answering my question yesterday and the extended write-up today. I really cannot wait to see how Jackson’s season ends up.